The opening reception for the four-day festival, set for September 16-20, 2009 at the Hyatt Regency Maui Resort and Spa, will include an multimedia show produced by MPF presenter and Canon Explorer of Light Eddie Tapp. Over 135 members and thousands of unique visitors per month. We now have over 135 regularly contributing members and thousands of unique visitors per month! Take advantage of our low priced advertising available for wedding photographers. The placement is in the right column on every page of the website (thousands!) Starting at only $24.50/month! Aloha fellow photographers and artists! All are welcome to attend this event...I would be pleased to meet you! I'm a new photographer and this is my first gallery show since college so I am excited. 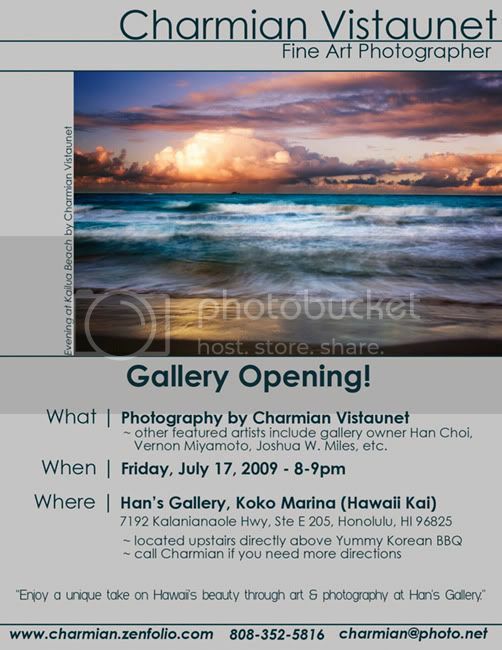 Han's Gallery is small and new as well, so it'd be great to get a nice crowd in there. If you happen to be in the area you should stop on by! Check out the updated website at harmonyjphotography.com. Enjoy!